Another slow start turned into another fast finish Wednesday, adding up to an-other High Desert Soccer Con-ference tournament champion-ship for Community School girls’ soccer team. Tied 1-1 at halftime with the upset-minded Gooding Sena-tors, the top-seeded Cutthroats pulled away with yet another three-goal hat trick by fresh-man Ella Viesturs and won their sixth straight HDSC tour-nament title 4-1 on the Sagewil-low Farms pitch. Senior Kyla Miller tallied the first goal, her first of the season, and was named the Cutthroat “Player of the Game.” Viesturs, Ella Pepin and Molly Milgard assisted on goals during the title game. Viesturs also scored three goals in the second half Mon-day, rallying the Cutthroats (12-2-2) past the Filer Wildcats by a 4-2 score after the home team trailed 2-1 at halftime. Speedy scoring threat Vies-turs (30 goals) now has six hat tricks for the season, all com-ing in the last nine games, and has scored goals in 13 of the 16 Cutthroat games. Unbeaten in 11 straight games, the Cutthroats qualified as the No. 1 seed out of the seven-team 4th District into the Idaho High School Activities Association State 3A tourney Oct. 23 at SunWay Soccer Com-plex in Twin Falls. 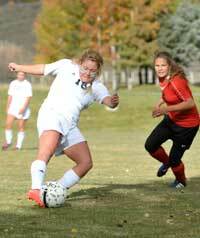 It will be the 16th Cutthroat visit to the state girls’ soccer tournament since 1996, and 14th consecutive trip. The Sun Valley teams boast a 10-5 state record in the last five years, and two straight State 3A run-ner-up finishes behind the McCall-Donnelly Vandals. The Cutthroats open their state quest Thursday, Oct. 23 at 2 p.m. in Twin Falls against the winner of this Saturday’s state play-in game between two east-ern Idaho squads. There is a chance the Com-munity School could play McCall-Donnelly again in the Oct. 25 championship game since the Vandals (9-5-1) slipped past Emmett 2-1 in overtime Tuesday in the 3rd District championship game. McCall plays 5th District champion Marsh Valley (14-2-0) in its first-round state game. Meanwhile, No. 3-seeded Gooding (8-4-3) will play No. 2-seeded Bliss (11-2-2) for the dis-trict’s second berth in the state tournament, with Bliss trying to avenge its 3-2 overtime loss to Gooding Monday. Bliss stayed alive 7-0 over No. 4 Filer Wednesday.